On behalf of our World Executive Committee and myself, I would like to express all my best wishes to each of you and your friends, a very happy World Art Day! May art enlighten most of your moments, help you in all your difficult moments, also most important of all, may art help overcome all prejudices around the world, all racisms, all wars, with the solidarity and friendship it creates among nations and people of the earth! We want to be enriched by your accounts of your activities, your stories, your ideas, your slogans! We believe it’s our duty to change the world for the better of our future generations! We wish a happy birthday to Leonardo da Vinci for 2019 that marks the 500th year of his passage to infinity. His versatile brain working in so many different directions and dimensions will always remain an inspiration source and example for all of us today and tomorrow! May art be your most friendly and effective weapon in life, in this world! Dear artist friends, National Committees! It’s a pleasure to address another Christmas and New Year’s greetings to you all! As the AIAP/IAA family, we represent the largest gathering of the contemporary artists and we know that we want to achieve also the world’s broadest geographical extension as well. Recently, in 2018, Colombia has added to our new list of countries composing IAA. Also USA’s and India’s application is now in process and their bylaws have been accepted buy the World Executive Committee. We welcome with our open arms, all new adhesions that we are expecting very soon to finalize. We feel richer and more fulfilled, the more our domain of influence and representation grows! We are happy to be welcoming all new countries that represent diversified and rich populations of the world. Here we are again on those beautiful spring days that are now the eternal host of our World Art Day, April 15! Life does not flow easily in these times, in different parts of the globe. Unfortunately, more and more war tensions surround us in various frontier zones. Terror, killings, threats, bombs or clashes, polemics, haunt us and enter our lives on regular basis. Watching the news becomes a burden in very many countries. Art is our haven, our meeting point for struggling against all these depressing issues. As I recently said in Puerto Rico, in a conference I gave at the University of Puerto Rico, 'Art is our pacifist weapon'. We only have our brushes and poems, and words, and sprays, and ideas, and inks, and stories and logic and rhetoric to bring universal peace to this tiring world. And we don’t want, their arms and armies and nuclear threats. This life is too important to waste with those shameful tools of aggression! We don’t want the world to smell pain and blood; we want the world to smell art, to smell paint, to smell green grass… World Art Day is our common child. It has a beautiful naivety and calls for a global sisterhood/ brotherhood around the world through art. Please send us all the information about your World Art Day activities, send us your program, your festivities, your photos, your publications, we will be more than happy to place them on our social media and website. As the World Executive Committee of IAA and myself, we congratulate you full heartedly for WAD 2018 and we wish you the best of health, success, happiness, and freedom with all our solidarity. Dear art lover friends from all over the world. May this email find you and your family in perfect health and spirit! As the year is coming to an end, and as the thought of Santa Claus is warning up our north hemisphere's cold days, together with all the member of my Executive Committee, we would like to express our best wishes to all of you for Christmas and the New Year. No matter to which country or religion we belong, what counts is our common good thoughts and dreams in this spinning good old planet! We hope that 2018, will be much more peaceful, without terror, without useless clashes between countries and with much more responsibility felt by our globe's citizens regarding ecology and the balances of this planet we share with our best friends, the animals. We also hope the art world is going to be a much more open platform with more and more countries involved, with more dialogues, less hegemony and more participation of the masses in art exhibitions. The last but not the least, we want to wish you a very healthy and happy New Year, with very many successes, new sparkling art works and beautiful events and exhibitions! We will be happy if you share our message with all your fellow artists in your National Committee and your website. I wish to all of you, a great new art season with this September, that has ended all our summer peacefulness in the northern hemisphere, while I wish the most beautiful spring days to our friends in the southern hemisphere. You have all received the Statutes amendments few days ago. I would like you to know that these new clauses for the statutes are the results of very long works and discussions over the table and online. We aimed to open our doors and hearts to more persons from the art world. It always had felt bad that we couldn’t take as member artists that didn’t have National Committees in their countries. Writing them those refusal letters was so disappointing for them as well as for us that we decided to make a move in the statutes. The second change also has come for two separate reasons. One of them was because we also have many non-artist historians, museum people, and or curators who wanted to become members of IAA. We wanted to find a way to include them without changing the fact that IAA would stay only as an artist association, always run and directed by professional artists. The second reason is that in several NCs around the world, we have already member friends that are not directly 'professional artists'. So we wanted to legalize them. I guess we have done a good job for this middle of the way arrangements. Let’s hope that it will contribute to the emancipation of the international friendships in dialogues all over the world, which will end up in growing synergy among all of us on the larger scale. Why do we need to be stronger and more numerous around the world? Why must we stay in touch with so many colleagues from around the world who are even in different positions, working in their studios, or in museums or in universities? Because, as you all know again very well, our world has been going towards very wrong directions may it be politically in regards of democracy and freedom of speech or may it be in regards to ecology and the protection of nature with its forests and oceans and wildlife. It is unbelievable that the United States under Trump has chosen to make abstraction of the concept of protection of nature. Even our friends who live in developed European nations should know that there are more threats then just wild terrorism and we should all be aware so that we don’t take anything for granted even in these harder days that we are living in. Dear friends from every NC and especially all NC presidents, there is one more thing that I will kindly ask all of you to comply with. Please do not let anybody, who is not a member of IAA, get the IAA card through our/your association. Not only it’s illegal and unfair for all the others, but also it’s illogical and even absurd. Somebody who is not a professional of the art scene, who is not a member of IAA, has nothing to do with the IAA card. Unfortunately there has been some obvious misunderstandings that made at some countries, we have seen and heard, gave out many cards to non-members or to members that only of National Associations without the IAA extension. This would create such a big confusion within the main body of IAA that we don’t want to think about. So please from now on make sure that every person you give an IAA card, with the mention 'official partner of UNESCO' is a member professional artist, a person worth in the arts scene. Please don’t undersign such a mistake that would be also illegal towards IAA and towards UNESCO as well. THE LAST, BUT NOT THE LEAST! Dear NCs and dear artist friends… I wish I did not have to tell you that - but I must -you have to remember that the IAA has been existing for almost 70 years only through the contributions of National Committees from around the world. Unfortunately in the last years, mostly European National Committees have been paying their fees regularly whereas we have had problems getting the yearly payments of several of our National Committees from Latin America, Africa, Arab countries and so on... Please understand that it’s extremely important that these fees should be paid regularly by every NC, otherwise we would be unfair to our friends who pay their fees. On top of that, IAA World would be facing serious financial problems. I am sure, you don’t want that! In order for all the NCs to be able to pay their yearly fee to the headquarters of IAA, you must remember that your NCs, can only pay their fees if you keep paying your yearly fee to your own National Committee as an artist. You see it’s very simple: If throughout the year you put aside, just tiny percentages of your pocket money or salary aside, in order to pay your fee to your National Committee, then things will happen more easily. If everybody proceeds like this, then it’s really not much heavy for your monthly budget, but if you don’t pay your fees yearly, it accumulates and anything that accumulates becomes a big burden. Where in Turkey, we have developed a system where artists can pay their fees to the National Committee by dividing their accumulated debt in four or five installments through the bank and their credit card. Then no matter what is the accumulated amount of debts, the wheel will still be rolling. We believe it’s a good solution. Also one more thing: we recommend to make arrangements and small contracts with various businesses that would give 5% or 10% discounts or even 3% discount to the card holders of IAA. That would also accelerate many payments and would generate new memberships. Trust me that this 'last but not least' paragraph was added because we want to preserve you as an artist, as a National Committee, as a friend in the body of a IAA. I hope that this letter finds all of you in great spirit and good health will in these days that are taking us closer and closer to Spring. I wish that also all of you had great artistic plans to I wanted to remind you few things that will be on our agenda during April 2017. Art Related Association/Foundation/Cultural Center/Museum of the Year. So you should have a commemorative plate ready for the winners of the year in your country, a plate carrying also the WAD logo and your National Committees and the IAA’s logo. Thus the power structure in your country, will feel honored to have been 'decorated' by the artists of the country within an international organization and a worldwide-celebrated event. AND/OR OF COURSE: ANY MAJOR Artist, or art movements or conceptually curated various shows. SPEECHES IN SCHOOLS OR MUSEUMS/ART CENTERS: Visiting, kindergartens, schools, high schools and universities, OR MUSEUMS and art centers, giving celebration speeches, talks about Leonardo’s multi faceted, multi disciplinary art life, or general talks about the revolutionary spirit of modern and contemporary art worlds. VISITS TO PRISONS: Or children prisons or rehabilitation centers are a good target for visiting and introducing friendship, solidarity and brotherhood of the power of art in the kindest way to people in need of warmth. ART BOOK SALES POINTS IN THE STREETS ON THE WAD WEEK END: Is something we have experienced and done in major streets with a good success and turnover. Museum bookstores and art or general bookstores thus have been able to reach audiences that normally don’t go to bookstores. OTHER IDEAS: Dear friends, we trust you and we know that you can come up with great innovative ideas that you will want to share with us and the whole world. Please think and inform your us, there will always be the next better idea! Look forward to hear from all of you, wishing you all our best in this coming spring, which I hope, will be beautiful! As we are ending a very tormented year again, I am addressing you from a part of the world that is unfortunately under constant turmoil or terrorist attacks. This was not the world we had expected in the 21st century, and we have to face this sad dramatic truth, which is hitting us everyday. Not just the near or the Middle East, but also so many different areas of the world are going through heavy dramas and a re suffering losses. We remember intensely the last 18 months where Paris, Nice, Brussels, Istanbul, Ankara, Berlin, Diyarbakir, USA hit by waves of attacks, while in the middle-east Syria and especially Haleppo have been almost totally devastated. The problems of the refugees are becoming major and primary concerns for every human being or country that carries a heart. These are definitely issues we have to talk about, discuss in depth and eventually raise projects around. There is one last thing I must remind you with your permission: We are four months ahead of World Art Day. We will stay in touch on this issue also of course. But please make a note that you should already plan your timing to find sponsors for shows or celebration dinners, you should prepare exhibitions, spread the use of the logo in the galleries and museums for April 2017, prepare panel discussions, events, children activities etc. I advise you to organize a much broader committee of WAD organization and not just your NC. All the members of our Executive Committee, Anne Pourny, Marta Mabel Perez, Franklyn King Glover, CHO Hang-Hoong, Pavol Kral, Dolores Ortiz, Maria Moroz, Ryoji Ikeda, Katarina Jönsson Norling, Christos Symeonides and myself, we wish you all a merry xmas and a very happy new year, far better than 2016! We have to hope still for the best, even if the language of the clouds has been telling us something different! With best wishes, hugs and solidarity! I hope you are all starting to boil with energy in our Northern hemisphere as spring is coming in. As you know well, spring has had another meaning for us in the last 5 years: April 15 has been celebrated as World Art Day since 2011. As IAA, we had unanimously accepted the proposal of Turkey in Guadalajara to celebrate the birthday of Leonardo da Vinci as World Art Day (WAD). As I had reminded you in President’s letter no.4 about WAD, this year we will celebrate it with a greater enthusiasm. The whole world should find out about WAD little by little, so that the importance and value attached to art. WAD aims to prove the solidarity and brotherhood among artists for freedom of speech, democracy and artist’s rights, all together simultaneously during the week of WAD. I kindly would like to ask you two special favors: The first one, please celebrate each others World Art Day, as densely as you would celebrate new year or Christmas; on that day, World Art Day must become trend topic and people who would not know what is WAD, on that day should become extremely curious and should try to find out what these three letters mean together. So please remind all your artist friends to use WAD and World Art Day logo and hashtags (#WorldArtDay #WorldArtDay'16 #WAD #WAD'16) everywhere in the social media, websites, banners etc. Of course they are also welcome to have real banners handy, if they want to place 'happy World Art Day' as banners & posters in front of their house and studio. It goes for you and me! By doing so we will stay in tune with each other and we will be more and more happy to discover thanks to all of us that the weight and exposure of IAA is spreading fast in our planet. This year during the WAD week, I will be the first in Los Angeles where the Downtown Art Walk is preparing several events for celebrating WAD. They are doing such a great job that we hope it will serve as an example for all the galleries around the world, besides our artists associations. After staying in LA during April 9-14, I will be in Mexico City where I will celebrate WAD together with our Mexican Association ARTAC members and our dear ex-president Rosa Maria Burillo Velasco at the Jose Luis Cuevas Museum in Mexico City, during April 15-17. I will return to Istanbul after few days in SFO and participate to few last events of the Turkish WAD. With all my best regards and love to all of you. The World Executive-Committee of IAA, is being held today and tomorrow, 8th and 9th of March in Istanbul, the hometown of World-President Bedri Baykam. Are present at the meeting: Bedri Baykam/ World-President, Turkey; Anne Pourny/ Vice-President, France; Franklyn Glover/ Africa-Coordinator, Ghana; Marta Mabel Perez/ Treasurer, Puerto Rico; Dolores Ortiz/ Latin-America Coordinator, Mexico; Andrea Kozarova/ Observer, Slovakia; Cho Kanghoon/ Asia-Coordinator, Korea; Jung Jun/ Delegate, Korea, Öykü Eras/ Executive-Assistant to the World President, Turkey; Tijen Sikar/ Observer, General-Secretary of UPSD Turkish National Committee. The IAA-World Executive-Commitee celebrates International Women's Day and we want to affirm our solidarity with all women of the world for their equal rights. We will fight in every possible manner all violence conducted against women and we will do our best to be their voice all over the world. May you be respected and honoured at the city gate because of your virtues. May you have divine flavor that will bring awesome taste into bitter lives of many women who are been abused in several ways by society. May you be empowered to impact lives within the spaces you find yourselves to make the world a better place to live. Happy International Women's Day, Congratulations! IAA/AIAP Official Partner of Unesco, World President Bedri Baykam, held today a press conference in Istanbul at the Piramid art center about the poet and artist Ashraf Fayadh who had been sentenced to death in Saudi Arabia. Participated: AICA Turkey President Evrim Altug, Artists Initiative Spokesmen Ataol Behramoglu and Orhan Aydin, Pen Turkey representant Halil Ibrahim Ozcan, Turkey Writer's Syndicate representant Aba Müslüm Celik, Sodev representant Inan Dagdelen, Theatre Actors representant Erhan Yazicioglu and several writers and artists. Also Miss Jennifer Clement, President of Pen international, sent a statement to the press conference in solidarity with IAA and the Turkish artists and writers associations. Now it has been 45 days since our GA was held in Pilsen, Czech Republic. We are already in the intense art season in these last weeks of 2015. Few weeks ago, I came together with our webteam, to work on a new page design and we hope to finalize this soon. We took some nice decisions and this new page might bring you a more clear and transparent vision about what’s happening in the IAA World. Meanwhile, talking about our website, we must remind you that the most difficult issue, is not to open a website, but it’s to keep that site alive with a constant flux of news images. So we kindly ask you to do your best in sending us your best selection of photos together with the most interesting and relevant news… Those might be issues of artistic, social clash, any censorship give links to each country’s own website. Send her your exhibition or life comments, news, studio or artworks as well as any joke or travel suggestions. You can follow me Twitter too, in order to keep short news and dialogue alive, as free as birds would do it! Although I have a personal twitter account have over 182.000 followers, which you are welcome to follow if you want, we will open a fresh account for our mutual shares, starting from point 0. The other one is my ongoing dialogue mostly with Turks! So you are welcome to follow our new twitter account @IaaWorld and start our dialogue and retweet our shares. My 'President’s letter number 4' will be about WAD next week. This is an open letter to the world’s art community for asking their solidarity about Ashraf Fayadh, the Saudi born Palestinian writer, artist and curator whom a Saudi Court has sentenced to death on November 17, 2015. Fayadh has been accused first of insulting religion or preaching atheism in 2013. When in 2014 he was arrested, police failed to prove his atheist propaganda, he was then being berated for 'smoking and having long hair'. Although Fayadh told the court about his innocence concerning the accusations of atheism and his attachment to God, the pressure of the religious police on the Saudi court has been effective. He was even accused of 'having had relationships with women' although he explained that the women were artist friends and photos on his phone, some of which were posted on Instagram, were taken during Jeddah art week (Saudi Arabia’s most important contemporary art event). 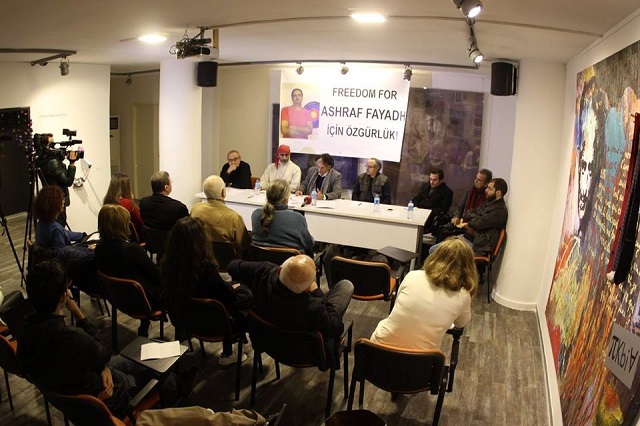 Please sign the petition here below, to show your solidarity with Ashraf Fayadh in order to stop his execution and free him. It’s with great shock and sadness that we have received the news of the random street massacres in Paris. Our pain is endless and we are looking forward to hear from Anne Pourny, our Vice-President of IAA/AIAP that none of our members are hurt. On the other hand, even that would never be a consolation to us since every citizen of the world is our sister or brother. Unfortunately all the ethnic or religious fundamentalist terrorist groups are more dangerous than one another. The world instead of seeing the technological space era in the 2000’s has seen the middle Ages. Fundamentalist terrorism should never become a shield for saving a field of action for terrorists. The right to live, the democratic right to chose one’s own life style, the right to express one’s self in artistic or written form, are, as untouchable as the religious citizens religious rights. We send our warmest and deepest feeling of solidarity and sympathy to all France and we send our condolences to all the families of the lost ones from whichever country they might be… We share their extreme agony and sadness. Of course, the same goes for all the families that have been the target of ISIS and all other terrorist groups in Afghanistan, Syria, Turkey or Iraq. IAA/AIAP as usual will do its outmost in order to try to help the atmosphere of peace to come back after this catastrophic turmoil in the capital of France.